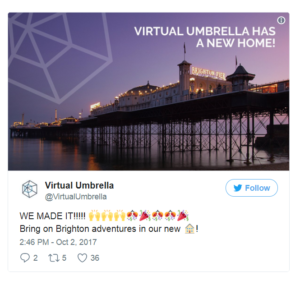 For us, here, at Virtual Umbrella we feel like we have blinked and 2018 is nearly over. We have gone through some huge changes over the year and we are feeling very positive about 2019 and where it will take us. Back in January we decided to have a clearer focus for the year with specialising in marketing, consultancy and events. 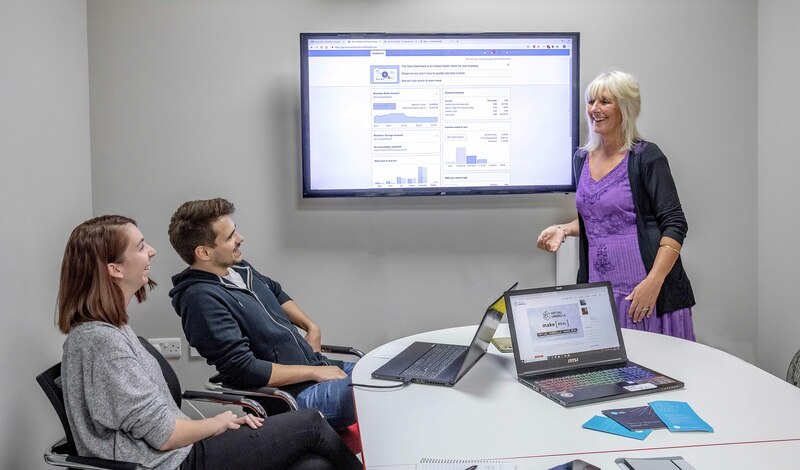 With the company turning three in March we felt it was important to make sure we were doing the work we really enjoyed and continued to grow alongside the industry. So far it has been a fantastic move. We have travelled all over the world, ran our VR Safari at a variety of businesses, won new clients and continued to consult and watch the market and opportunities grow. 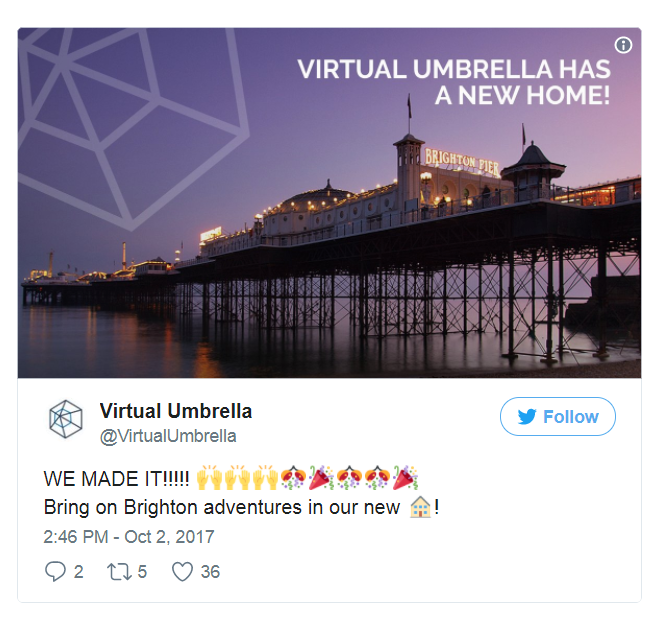 As many of you will know we put the Virtual Umbrella office into a van and moved down to Brighton over a year ago. We have fallen in love with living and working by the sea. It is has been great to be surrounded by industry friends and be apart of the beach side work life. 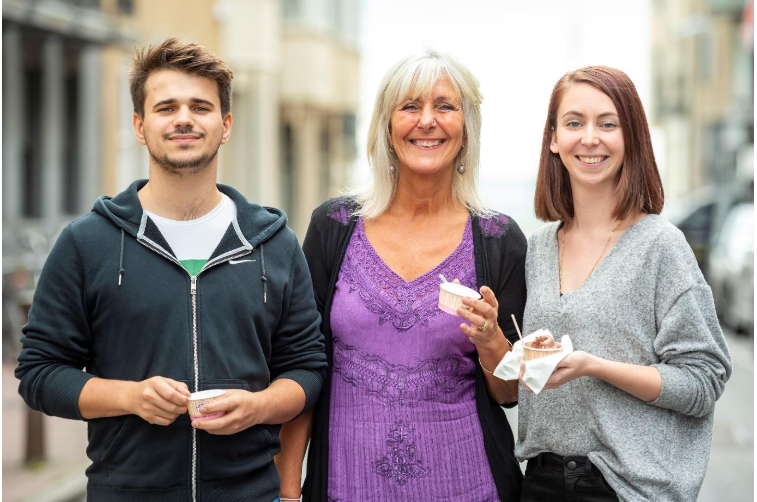 The wonderful Make Real welcomed us to work in their office, we feel so lucky to have been accepted with open arms and feel really apart of Brighton, the team and our new home. For Bertie and I (Samantha) one of our big focuses for 2018 was hiring some incredible people to help us keep the umbrella up. We do take a long time with our hiring process, but that is down to us seeking out unique creative leaders, who not only fit our culture but also bring a depth and breadth of experience with them. We are really proud of the team we are building. We feel incredibly lucky to have won two new retained clients this year. We love working for people who be believe in and are doing incredible work in our industry. In case you missed our blogs about our new clients check out the links below. The team is made up of some incredible talented individuals under the driving force of Richard Nockles. We are excited to be apart of the team and to see what magic they create in 2019. Sam Watts from Make Real was one of the first people we ever met in the industry. Back in the day before we had started the business. 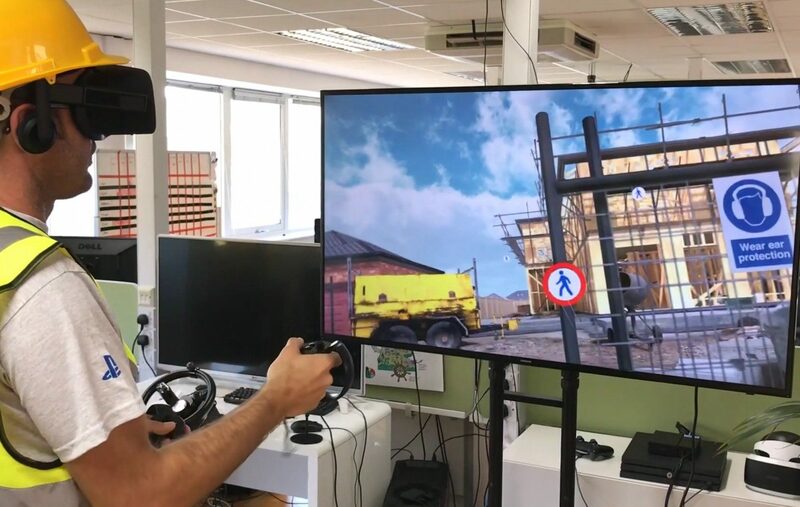 Radial- G was one of the first VR games that our Managing Director Bertie tried. We always enjoyed bumping into Sam at events, who is the king on speaking and demoing at VR Events in the UK. We have been big fans of the incredible solution based content that Make Real has been making behind the scenes and of course their innovation and confidence in experimenting with technology. We were very excited to meet the CEO earlier in the year when we moved to Brighton. After being kind enough to offer us some desk space in their office we ended up working together. Becoming more stable as a startup has been the focus since the beginning but 2018 has been the first year where we really feel like that is happening. A big lesson for this year has been looking after our accounts. We discovered Plus Accounting early in 2018 and they have turned our “Accounting” world around. We highly recommend them if you are looking for an accounting team you can trust. They run fantastic events too from taxes to growth and more. Plus they let us eat ice cream during a photo shoot with them. We are very luck to be able to work on a variety of projects through out the year. We asked the team to highlight some of their favourite projects or events from the year that you might have missed. In March we were introduced the amazing work being done by the Philharmonia Orchestra and they sent Bertie to SXSW to help run Beethoven’s Fifth. A virtual reality experience in a huge soundproofed box with a cutting-edge 3D audio array. 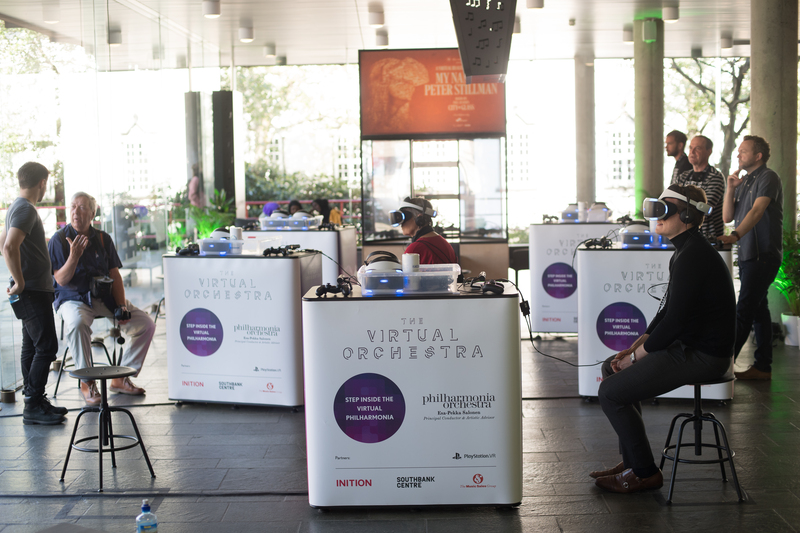 It was the beginning of a great relationship and we have been fortunate to have continued working with the Philharmonia team, looking after VR installations in cultural institutions across Scandinavia and the UK. 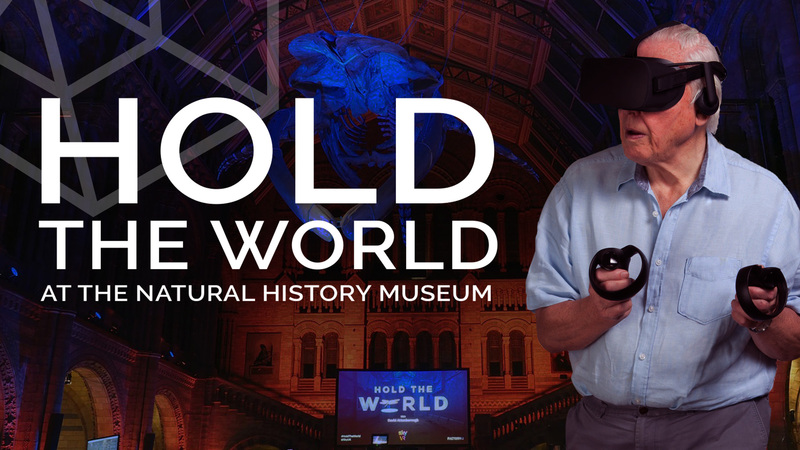 As part of work with our Hire Partners, Blue Hire, we were providing technical support at Sky UK’s launch of Hold The World. The event was held in the Natural History Museum and the mood was electric. During the evening there was an opportunity to hear from living legend David Attenborough himself. It was a wonderful opportunity. As many of you will know we travel a lot during the year for clients, events and more and one of our biggest highlights of the year was when we were introduced to the ICRC via Sheffield documentary festival curator, Dan Tucker. 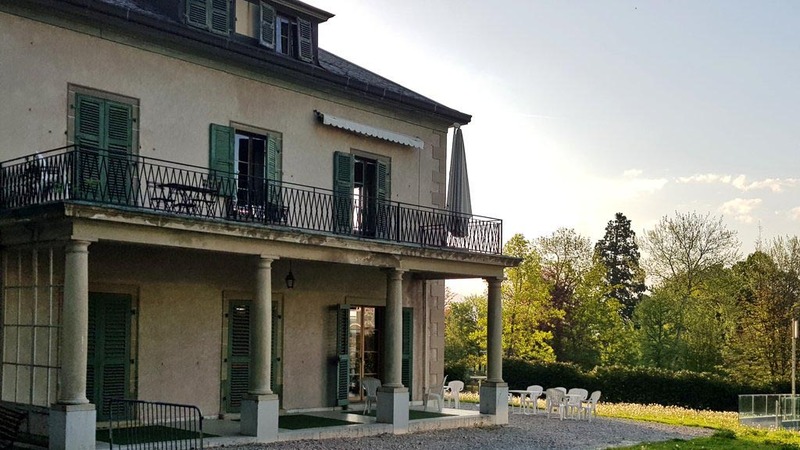 Working alongside the great ICRC team and 4 content creators, Dan Tucker and VU staff headed to Geneva to run two rooms full of VR and AR content. We showcased a range of experiences on the HTC Vive, Oculus, and Gear VR. Content included: ‘Aftershock: Nepal’s Untold Water Story’, ‘Ayan’s Journey’, ‘Mamie’s Dream’, ‘The Journey’, ‘After Solitary’, ‘Deathtolls Experience’, and ‘We Wait’. Alongside the VR demos, we also had a VR panel moderated by Dan Tucker. The focus of the panel was to allow each speaker to share their case studies (which the audience would have tried out during the day), and to bring together a discussion about the humanitarian value of immersive technology, tips on creating VR experiences, and what the legacy of a VR piece can be once it’s been created. 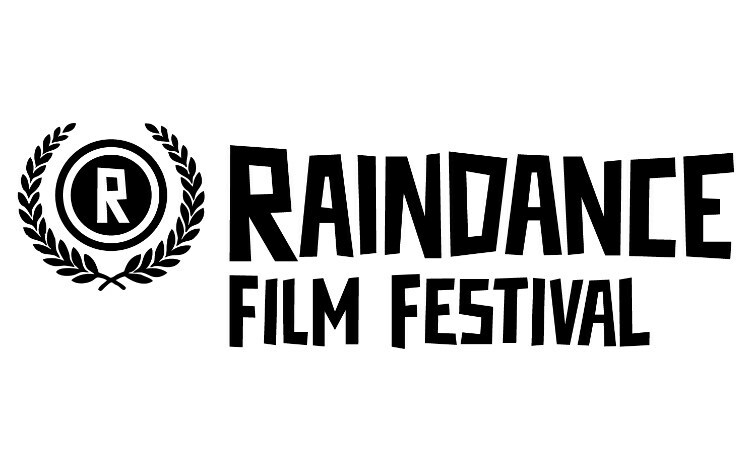 This year, Virtual Umbrella was approached by the VR Curator of Raindance Film Festival, Mária Rakušanová, to help present their 2018 virtual reality showcase: ‘The Raindance Gallery of Immersive Stories and Interactive Worlds’. Following on from our work with a number of other film festivals, she felt that we were a great fit for the project; and we were delighted to be able to work alongside such a prestigious brand & institution. The showcase itself ran over three days at the OXO Tower in London (OXO2, 5th-7th October). There were 33 different experiences available across a range of headsets, including ‘7 Miracles’ (credited as the world’s first feature-length film in VR), ‘Transference’, ‘Arden’s Wake: Tide’s Fall’, and ‘Crow: The Legend’ (each featuring actors/celebrities such as Elijah Wood, Alicia Vikander, Oprah Winfrey, John Legend, and more). One of the most technically impressive pieces was ‘The Apple’, which VR Focus described as a ‘blissfully’ relaxing piece ‘set up as a 40sqm experience, using HTC Vive Pros and backpacks [to allow] two people to freely explore the magical world’. In June 2018, Virtual Umbrella was hired by Parable to deliver community screenings of their immersive documentary, ‘Grenfell: Our Home’. 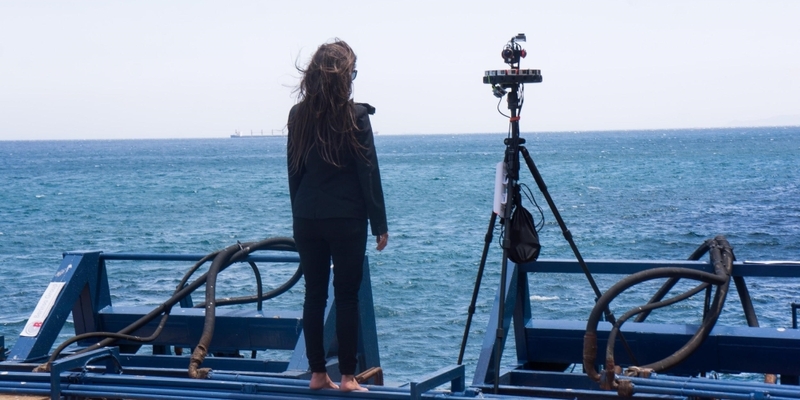 The experience focuses on peoples’ lives before the fire of 14th June 2017 and has been described as ‘an essential VR documentary’. 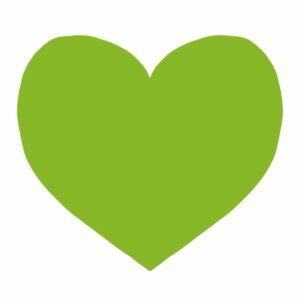 We are incredibly proud to have been able to support the community surrounding the Grenfell Tower. And, alongside our partners, we knew how important it was to present the piece in the right way. We took the film to a number of locations in West London, bringing viewing opportunities to local people using 12 GearVR headsets, Samsung S8 phones, and noise cancelling headphones. To give a communal feel to the screenings, we also ran the viewings simultaneously using Showtime syncing software. This meant that everyone could view the piece at the same time, finishing collectively for shared decompression and discussion. Our team were on-hand throughout to ensure everything ran to schedule and without error. Some of the most important work, however, focused on providing context and support. We delivered opening briefs to our visitors to ensure they understood what they would be seeing, and how it might make them feel. It was also our responsibility to make sure they were aware that resources were available on site to assist them if needed. We are grateful to Parable for the opportunity to work on a project that we care so deeply about and to the NHS for providing mental health support staff to provide comfort to those affected. As we venture into our fourth year of running Virtual Umbrella (what!!) we are incredibly excited to see where the year goes. We have to say a big thank you to everyone who has continued to support us and has seen us grow. 2019 for Virtual Umbrella is all about growth and seeing how we can continue to help the industry grow in the most positive way. Are you doing something exciting in 2019 and need some help? Why not give us a shout. If you like to keep in the loop with what we get up too make sure you follow us on Twitter and why not sign up to our newsletter, where we share our updates and VR events that you should be checking out in the UK.